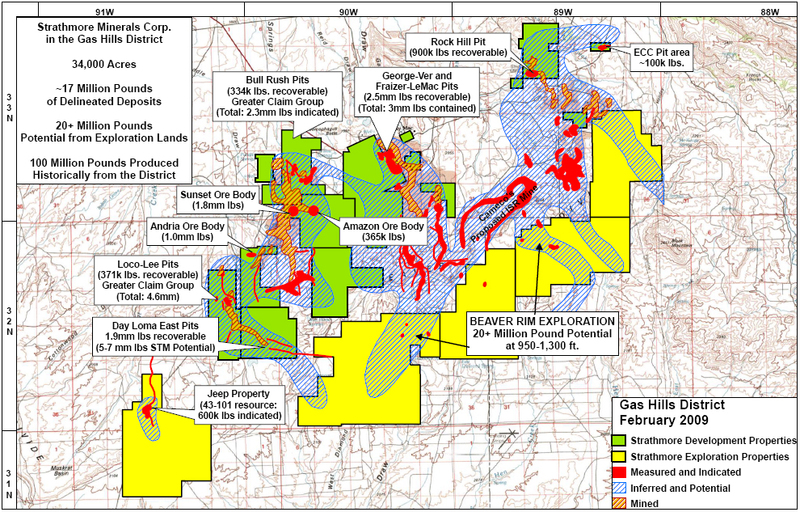 During the great uranium bubble of 2005-2007, there was many a company whose “flagship project” consisted of a skinny uranium-bearing vein cropping out within a few thousand acres of goat pasture in some remote corner of the Earth or a few million hectares of moose pasture, muskeg, and barrens with an airborne radiometric anomaly in the far Canadian North. 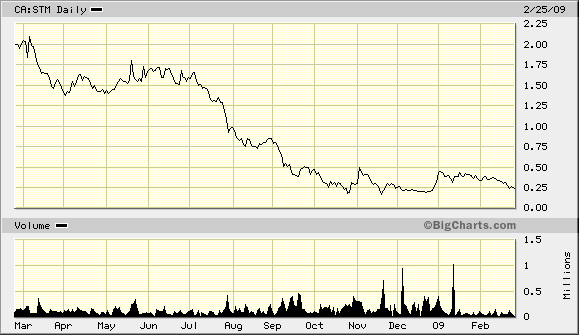 Uranium companies ran up in 2005 and came crashing down in the summer and fall of 2007. Most will never recover; many are now defunct. These juniors had something in common: They were missing one of the three key ingredients for success, a Flagship Project of merit. Strathmore Minerals Corp (STM.V): The true “Super Uranium Junior”. 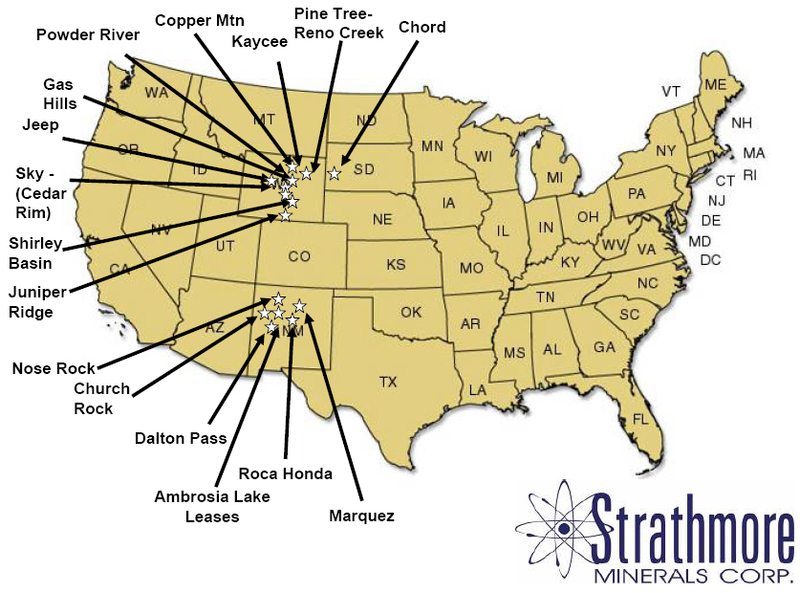 Strathmore’s business model is based on acquiring and developing “pounds-in-the ground” U3O8 in western United States districts with significant historic production from the 1950’s to1980’s. It controls major deposits in the giant uranium fields of Wyoming and New Mexico. These two are the largest past-producing states in the United States and have the ore deposits, infrastructure, pro-mining attitudes, and permitting environments that should lead to timely production decisions in the near future. Strathmore's corporate mandate is simple: Become a uranium producer in the western United States. It was organized as a uranium company in 1996 and executed its property acquisition strategy in 2003-04 when the uranium price was between $7 and $15/lb. 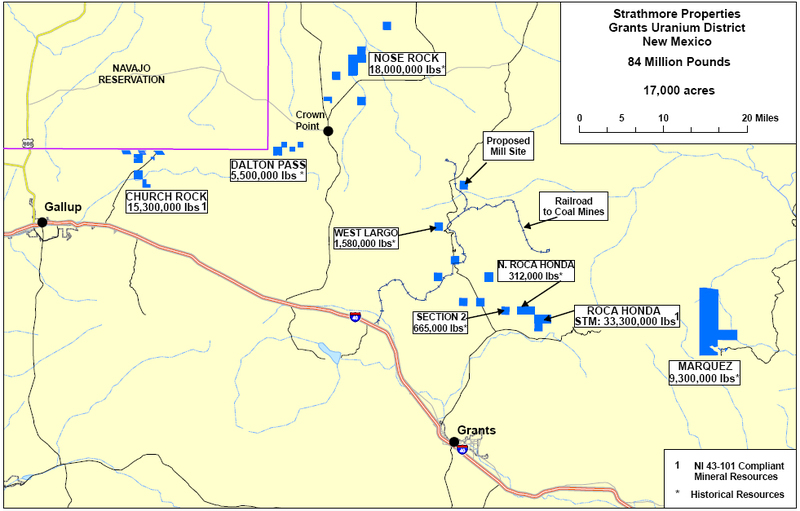 STM acquired advanced uranium projects in Wyoming and New Mexico, many of which were extensively explored and advanced to the mine planning stage in the 1970’s. For example, in 2004 they were the only company to submit a bid in the New Mexico lease auction and acquired a state section hosting part of the Roca Honda deposit with a bid of $2316. Historic documents indicate that Western Nuclear acquired the same ground in 1979 for $10 million. In 2005 operations offices were opened in Riverton Wyoming and Santa Fe, New Mexico and the company was off and running. Its primary focus is to advance three core projects to production: Gas Hills and Pine Tree-Reno Creek in Wyoming and Roca Honda in New Mexico. The company holds 100% of the Gas Hills, the Roca Honda, New Mexico project is a 60-40 joint venture with Sumitomo Corp of Japan, and the Pine Tree-Reno Creek project is a joint venture with American Uranium Corporation who can earn 60%. the last uranium boom in the late 1970’s. Included in the mix are David Miller, CEO; Steve Khan, President; Dr. Dieter Krewedl, Director and a geologist who I have known for over 25 years; Michael Halvorson and Ralph Groening, Directors; Ray Larson, Director and ISR expert; Pat Groening, CFO; Jim Crouch, VP-Wyoming Operations; John DeJoia, VP-New Mexico Operations; and Juan Velasquez, VP-Environmental and Regulatory Affairs. In addition, Strathmore has retained more than 40 technical consultants to facilitate environmental permitting, hydrology, engineering, construction, and development as it moves toward production in Wyoming and New Mexico. Strathmore has a well-managed share structure with 72.5 mm shares outstanding, 6.1 mm options at 41c, $7.8 mm in working cap as of December 31, and a $460,000/month burn rate. Insiders control approximately 6%, and Sprott Asset Management owns 17.5 % of the company. Other institutional holdings are estimated at about 8% and the public stock float is a healthy 50 million shares. Liquidity has been moderate since the beginning of 2009. During the past year, STM has advanced its three core projects closer to permitting and development decisions. The current price of about 22c gives a market capitalization of $16 million. This is very low compared to its peers in the uranium development sector. Recently the management of Strathmore reviewed and prioritized all its projects and programs. Discretionary expenditures were eliminated or reduced, and effective beginning 2009, the company’s senior managers have tightened their own belts with a 20% salary cut. I’ve said this before and I’ll say it again: I love when corporate muckety-mucks take pay cuts in difficult financial times. It tells me they are prioritizing the company’s bottom line and shareholders’ best interest rather than fattening their own pocketbooks. Secondary projects are deferred and focus will be on the core mine development projects: Gas Hills and Pine Tree-Reno Creek in Wyoming, and Roca Honda in New Mexico. They will continue to explore joint venture opportunities for non-core projects. Working capital is more than sufficient to carry out the 2009 program plan. The Wyoming Basins are home to the second largest uranium production in the United States exceeding 200 million pounds U3O8. Two ISR uranium mines are currently permitted and one is operating. Strathmore’s Wyoming projects are mostly roll-front deposits amenable to open-pit mining or ISR. They include targets in the Gas Hills, Powder River Basin, and Shirley Basin districts with land positions over 91,000 acres. One of their flagship projects is in the prolific Gas Hills of Wyoming with more than 100 million pounds of past production. The company's 34,000 acre portfolio includes eight areas of known mineralization, six were previously permitted for mining, and total historic measured and indicated resources are 17 million pounds U3O8. Existing infrastructure includes paved roads, power, and natural gas. Primary focus is on permitting the George Ver deposit, which will be the first in a series of sequentially mined open pits. In 2008 Strathmore continued permitting activities, geological and engineering design of mines, and water quality and environmental baseline studies. miles south of the project, does not come to fruition. Drill permits for its Rock Hill and Beaver Rim properties also were received. Another of STM’s core assets is the Pine Tree-Reno Creek ISR project which comprises 18,000 ac and is located in the Pumpkin Buttes district of the Powder River Basin. The properties are in proximity to AREVA's idle Christensen Ranch in-situ facility and Cameco's producing Smith Ranch in-situ mine. In 2007 Strathmore joint ventured the project with American Uranium Corporation (ACUC.OTCBB) which has committed to spend US$12.4 million to earn an initial 22.5 % in the project and US$33 million over six years to earn a 60% interest. 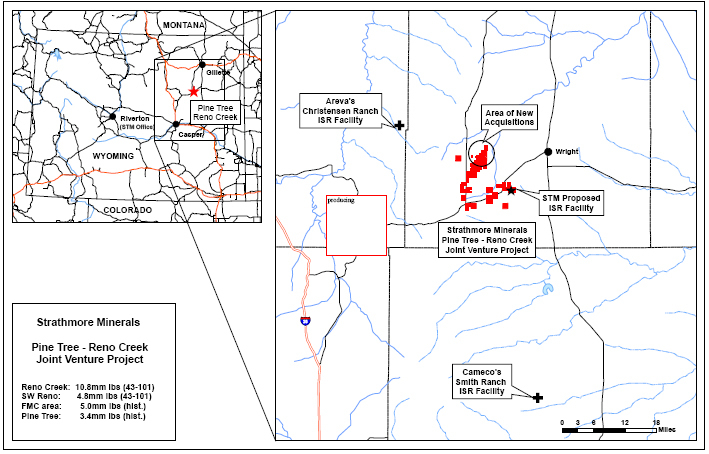 In 2008, Strathmore completed two 43-101 resource estimates for the Reno Creek portion of the land package resulting in measured and indicated resources of nearly 11.0 million pounds grading 0.065% U3O8 and an additional 4.7 million pounds inferred. Including historic resources at the Pine Tree, SWD, FMC, and recently acquired Moore-McCullough properties, total historic and 43-101 qualified resources at the project are 24 million pounds U3O8. Pine Tree-Reno Creek is being developed as an in-situ recovery operation. Wells will be installed in 2009 to establish baseline data for a mine permit application. Mt. Taylor. Land positions in New Mexico total over 17,000 acres and historic and 43-101 resources comprise over 84 million pounds. STM’s flagship project in New Mexico is Roca Honda, which was acquired in 2004 as a mine-ready deposit with more than 800,000 feet of drilling. The acquisition also included Kerr McGee’s uranium database, the most comprehensive and extensive among former western uranium producers. Roca Honda is arguably the best undeveloped uranium deposit in the U.S.A. Strathmore’s strategic partner is Sumitomo of Japan, a Fortune 500 company which can earn 40%. The participation of a giant conglomerate such as Sumitomo in Strathmore’s New Mexico mining ventures speaks volumes about the quality of their management, projects, and chances for future success. 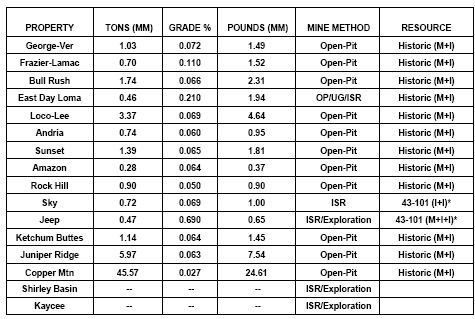 A 43-101 resource calculation produced measured and indicated mineral resources of 17.5 million pounds U3O8with a grade of 0.23% and an additional 15.8 million pounds inferred at an average grade of 0.17%. Strathmore’s geologists think there is strong potential for more than 50 million pounds in their portion of the Roca Honda deposit. This premise is supported by a groundwater monitoring well drilled outside the known resource in the summer of 2007 that hit nine feet of 0.56% U3O8. Although only a single drill hole, that is a high grade intercept with substantial width for the Grants Mineral Belt. 2008 development at Roca Honda included a 30% mill design by the company’s engineering consultants expandable from 3500 to 7000 t/day and significant baseline environmental studies. A feasibility study is on-going and mill site alternatives are being reviewed. The Strathmore-Sumitomo JV to develop Roca Honda and Sumitomo’s minimum $50 million commitment to the project with a positive production decision add considerable value to the company. Negotiations to build a custom toll mill in the Grants Mineral Belt are on-going. Most industry and political insiders think that there will be a single custom toll mill permitted in the state and the consortium that constructs the mill will control future uranium production in New Mexico. The Strathmore/Sumitomo strategic alliance certainly will be a major player in that mix. The economic picture for uranium is bullish in the near to mid term with production shortfalls predicted for the next ten years. The United States of America is the single largest consumer of uranium globally and its 104 nuclear reactors provide 20% of the country’s electrical needs. We currently use about 55 million pounds per year but produce only about 4 million pounds. About one-half of current consumption is provided by the Russian government’s conversion of nuclear warheads into low enriched uranium, the so-called “Megatons for Megawatts” program. This source of supply will end in 2013. Where is the USA going to get its yellowcake to power our nuclear plants in the years ahead? Domestic production is an integral part of the supply equation, and an important component of the long-term energy needs of the United States. The need for a viable domestic uranium mining industry is crucial as part of a comprehensive energy plan. The fundamental supply shortfall should benefit uranium prices and emerging uranium producers like Strathmore Minerals Corp. 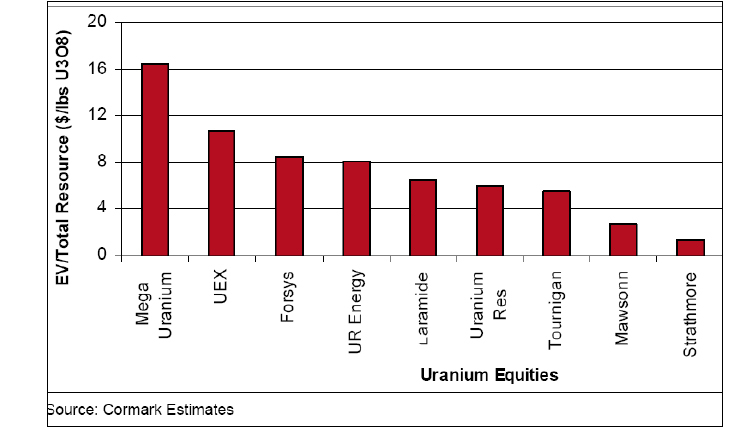 Despite the sharp decline and volatility in global capital markets in the second half of 2008, the long-term uranium price has remained firm at US $70/lb. The spot price reached a low of US $43/lb and is currently at US $45/lb. However, the vast majority of uranium supply is bought via long term contract and spot sales fill only a small niche in the overall market. 2009 is potentially a watershed year for Strathmore Minerals. Management expects the mine permit application for the Gas Hills to be submitted, wells will be installed to collect data in support of the mine application for Pinetree-Reno Creek, and the mine permit application for Roca Honda, New Mexico will be submitted. There is no exploration risk with Strathmore as its many resources were developed in the 1970’s and many were nearly ready for mining in the 1980’s when the domestic industry was devastated by the Three Mile Island fiasco followed by collapse of the price of uranium. As with all uranium explorers and developers throughout the world, the biggest risks are long lead times for permitting and production. This is mitigated with STM’s ISR projects in Wyoming. Final mine and mill permits are still in question in New Mexico where a significant amount of Strathmore’s pounds in the ground are located. The viability of the uranium price is always of concern. However, with nuclear power gaining increased acceptance as an environmentally friendly energy technology, demand should continue to be strong in the next ten years. Supply destruction due to on-going water problems at the world’s two best uranium deposits, Cigar Lake and McArthur River, and the cessation of Russian exports in 2013 will exacerbate an on-going world production shortfall. These factors bode well for the future price of the metal. Longer term supply and demand predictions are largely dependent on exploration and mining success in the large, high grade deposits of the Athabasca Basin where there is a long lead time to production. Uncertain world economic conditions could lead to delay or scuttling of proposed nuclear power plant construction and expansions resulting in decreased demand and a depressed uranium price beyond the predicted near to mid term supply crunch. With its near term production scenario in Wyoming, mid term production scenario in New Mexico, and a steady pipeline of pounds-in-the-ground projects in both states available for joint venture, Strathmore Minerals Corp is well situated to profit from the projected supply deficit in the next 10 years. Take a look at Strathmore Minerals: The True Super Uranium Junior. Do your own due diligence and see what you think. I like it. I own it. I’m biased. ‘Nuff said. Disclaimer: I am a shareholder of the company and was paid a fee for this report. I am not a certified financial analyst, broker, or professional qualified to offer investment advice. Nothing in a technical report, commentary, this website, and other content constitutes or can be construed as investment advice or an offer or solicitation to buy or sell stock. Information is obtained from research of public documents and content available on the company’s website, regulatory filings, various stock exchange websites, and stock information services, through discussions with company representatives, agents, other professionals and investors, and field visits. While the information is believed to be accurate and reliable, it is not guaranteed or implied to be so. The information may not be complete or correct; it is provided in good faith but without any legal responsibility or obligation to provide future updates. I accept no responsibility, or assume any liability, whatsoever, for any direct, indirect or consequential loss arising from the use of the information. The information contained in a technical report, commentary, this website, and other content is subject to change without notice, may become outdated, and will not be updated. A technical report, commentary, this website, and other content reflect my personal opinions and views and nothing more. All content of this website is subject to international copyright protection and no part or portion of this website, technical report, commentary, and other content may be altered, reproduced, copied, emailed, faxed, or distributed in any form without the express written consent of Michael S. (Mickey) Fulp, Mercenary Geologist.